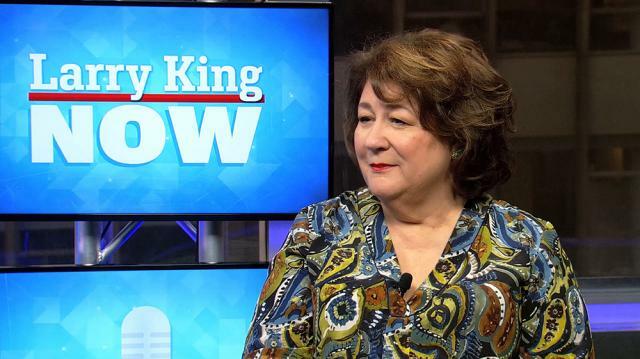 Three-time Emmy-winning actress Margo Martindale talks her hit FX show 'The Americans', revisits her time working on renowned films like 'August: Osage County,' and weighs in on ageism in Hollywood. Larry talks to Margo Martindale, a three-time Emmy Award-winning actress with roles in films like ‘The Hours,’ ‘Million Dollar Baby,’ ‘August: Osage County,’ and ‘Lorenzo’s Oil.’ On TV, she’s had parts in ‘Justified’ and ‘The Good Wife,’ and is currently in FX’s ‘The Americans.’ When Larry asks her why a magazine called ‘The Americans’ “the best show on television,” Martindale says it’s the writing, which is deep and complicated. She loves working with the main characters, and likes how cerebral her Russian spy character, Claudia, is. Larry asks if this is the golden age of TV, with HBO and Netflix, and she agrees it’s a new golden age, with more time to tell stories. Martindale’s story includes gaining better roles as she’s aged. It was amazing to win her first Emmy at 60, she says. In response to Larry’s question about life as a character actor, she responds that it’s mostly quiet, but lately she’s been recognized more, making her flattered but overwhelmed. In addition to her achievements on the screen, Martindale has also appeared in many plays. Larry asks her about a play-to-film adaptation she starred in, ‘August: Osage County.’ She raves about the movie, though it was tough playing an unsympathetic character. However, answering Larry’s inquiry about gender inequality in Hollywood, Martindale says women are getting more great roles and making a turnaround. Larry asks about her big break, and she describes getting into film when Hollywood people say her act in the play ‘Steel Magnolias.’ But though she works in Hollywood and is from Texas, Martindale says she stays in New York because she loves the energy and familiarity. When Larry asks if she would return to another familiar spot, the stage, Martindale says yes, if the right role comes along.